Enjoy all the colour and excitement as Alvaro paints the flamboyant characters that abound in the beautiful city of Havana. Learn as he shows how to convey the colour and character of backlit musicians, the city's bicycle taxi riders hanging round on street corners, the music and ambience in Havana’s famous café, la Taberna, the atmosphere of a quaint old barbershop and, best of all, enjoy the fun as Alvaro paints one of Havana's famous cigar smoking women. In the second part of his Cuban adventure, Alvaro turns his attention to the people of its capital city and its vibrant street life. Much has happened since the first instalment and the rapprochement with the US means that the island’s days of crumbling glory are surely numbered. If this is something that appeals, visit now, or maybe buy these films as a fitting memorial. If you’re a Cuban, however, you might think that much-repaired 1950’s automobiles and flaking stucco are a high price to pay for a romantic dream. Maybe you’d prefer a new car and some anonymous malls. Alvaro is an enthusiastic demonstrator and a great talker. For some, his style of presentation might grate but, for me, he always manages to stay within the border of being irritating and he’s immensely quotable: “We need to get to know the people … absorb the atmosphere … then we paint”, “It’s a mess with order to it … we need to avoid complexity”. These nuggets of wisdom (and they are nuggets) relate not only to the technical details but to the general approach. There’s one place, in a particularly complex scene near the end of the film, where Alvaro works in silence for a minute or two and it comes as something of a shock. 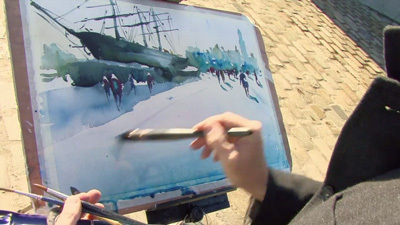 Normally, he’s talking about the scene, what he’s looking at and for and how he’s working with water, brushes and colour. 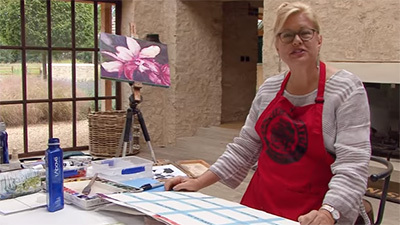 He’s a confident painter and this often masks very considerable skill. His remark that he needs to envision the finished result before he starts is telling. It looks improvised but, like the music that pervades the film, it’s actually very carefully structured. A word about that music. Alvaro often moves with it and he’s also, he says, painting with it. Certainly, there’s a rhythm to the way he works that the music both drives and points up. I think it’s also worth saying that the way the soundtrack is handled here is worthy of top-flight documentary–making. It’s not, as is usually the case, something that’s added later – and which will either enhance the viewing experience or annoy the hell out of you. In two of the demonstrations, there’s a live band playing and this, the commentary and the wild track (the background noises) are perfectly balanced. When Alvaro speaks, the music fades ever so slightly so that his voice is never muffled, but the sound is always a homogeneous whole. On that score, I’d class this as the best film I’ve seen from APV. 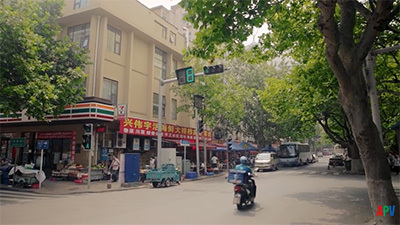 Street life is complex and real life doesn’t always appear in a neatly balanced composition. As he did with the first film, Alvaro assembles his images from their component elements. Figures are moved into a more balanced group, details are highlighted and focus shifted. 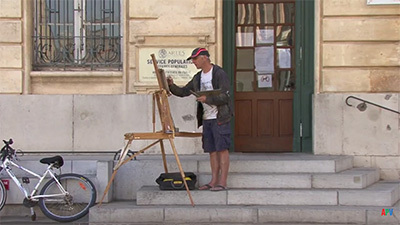 His loose style means that fine detail is never there: “I’m not interested in making a portrait”. For me, this looseness makes this a slightly less satisfying film than the first part as some of the groups start to look a bit similar – I wish he perhaps wouldn’t strait-jacket them quite so much into a single personal style. Nevertheless, there’s no doubting the artistry, especially in the composition and the handling of complex and often difficult lighting, where Alvaro is pretty much pitch-perfect. Artists & Illustrators contributor Alvaro Castagnet continues his watercolour world tour with a trip to Cuba this month for his latest DVD. After tackling the crumbling architecture of the Cuban capital in the first volume of The Passionate Painter in Havana, this second instalment, released this month, sees the Uruguayan painter turn his attentions to the many colourful characters he meets in the city’s cafés, barbershops and sun-soaked streets. 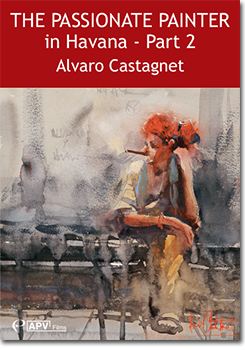 Imbued with his trademark flamboyance and dynamism, Castagnet’s demonstrations show you how to capture the essence of a scene using a rich palette of colours and a series of decisive marks. Alvaro Castagnet has been a passionate painter in Antwerp, Paris and the North of England and now it’s Havana’s turn – and what better place to show the painter’s vibrant watercolours than the heat and colour of Cuba’s capital city. 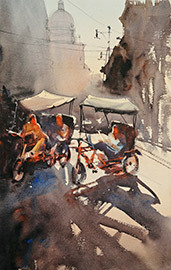 Alvaro has a quick watercolour painting style born of many years’ experience that makes what he does look simple. 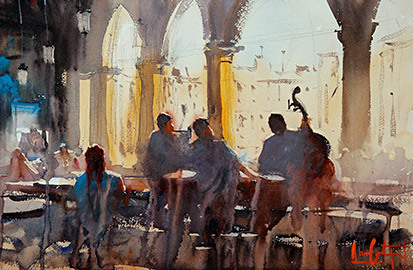 He builds up paintings in layers, using broad brushworks and large brushes, creating expressive paintings full of atmosphere and dramatic use of light and shade. 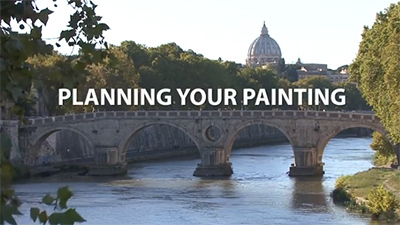 Part one of the two-part set includes five demonstrations that concentrate on the streets and architecture of the city – from the broad boulevards furnished with 1950s’ American cars to the narrow cobbled streets. Alvaro’s commentary is lively an charismatic, unhindered by technical jargon. Part two concentrates on the flamboyant characters in the city – musicians and bicycle taxi riders, café scenes, a barbershop and one of Havana’s famous cigar smoking women. 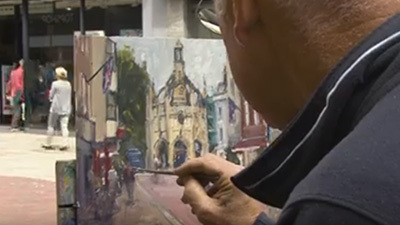 It’s fascinating to watch him at work and both his paintings and this timewarp city are sure to captivate you. In the second part of his adventures on Cuba Alvaro Castagnet paints people, capturing the vibrancy of street life and ‘the spirit of the place’. The main elements of Alvaro’s work are light and arrangement. He stresses the importance of being aware of the former’s source, strength and direction and uses washes to create highlights, shadows and contre jour effects. As regards composition, he often rearranges elements to enhance unity and impact. There is a confidence to the way Alvaro works that conceals much of the skill, but he explains what he is doing throughout and quotable nuggets of wisdom drip from the film. It’s impossible not to get carried along with his enthusiasms. 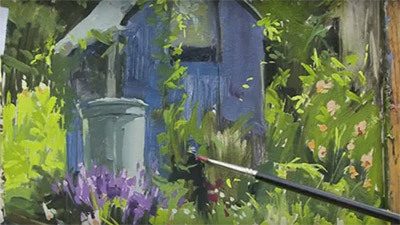 One of my favourite videos and definitely my favorite watercolor artist! Love Alvaro's character, he makes everything so fun and the location could not be more exciting. Totally worth the download.